On Thursday, September 12th, PACT arrived in Lachine, Quebec, completing our 5252km journey across Canada. After a night of thunder and lightning, we began day 120 in the pouring rain. A few hours later, the sky was blue and the sun was shinning as we arrived at the Fur Trade at Lachine National Historic Site. Thanks so much to all of our family and friends who came out for an incredible welcome! While our journey may be over, PACT’s mission is far from complete…. Please continue to check our website for new blogs, photos and events! We have many more stories, photos and memories to share. Our journey over and we can't wait to celebrate with all of our biggest supporters! Roots Canada is hosting a welcome-home reception, so come on out to see some photos, hear about our journey and give us a high-five! Snacks and refreshments will be provided, and the party will continue at The Quail and Firkin for those interested in making a night of it! 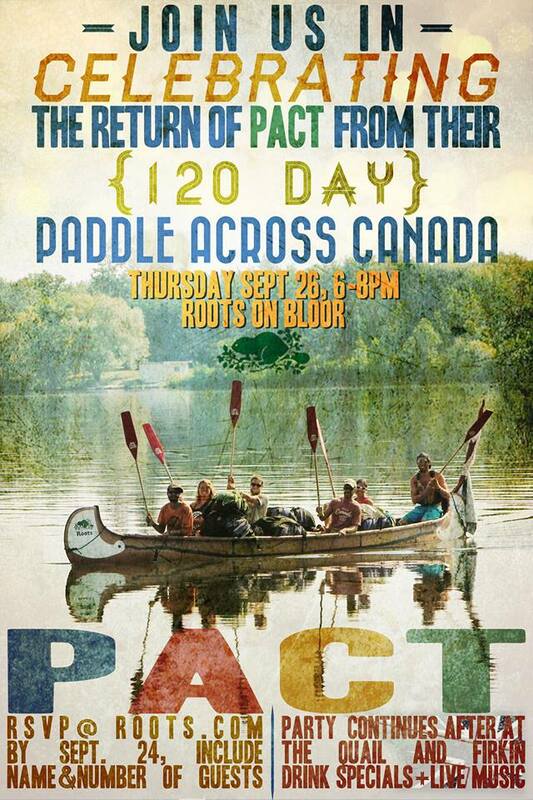 To attend please send an email to rsvp@roots.com with your name and number of guests before September 24th.